This week famous faces celebrated US Mother's Day and Skepta promoted his new album 'Konnichiwa'. 1. 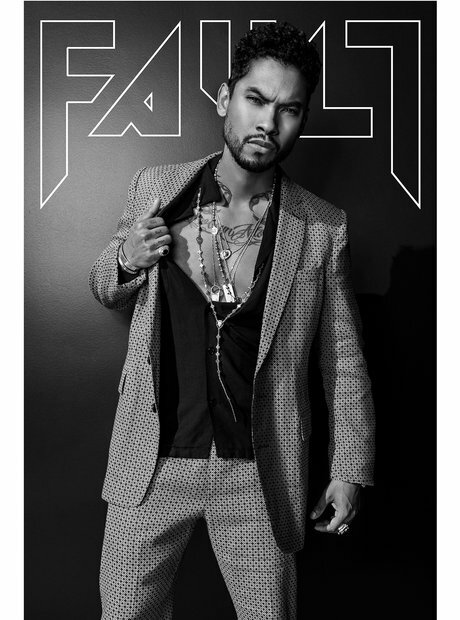 Miguel was the cover star of this month's Fault Magazine. 2. The 'Adorn' singer has been frequently been compared to Prince since his death. 3. And he takes it as a compliment. 4. Drake was spotted in the studio with French Montana. 5. Kanye West and Kim Kardashian celebrated Valentino's birthday. 6. Stormzy launched the new Manchester United Away shirt alongside David Beckham. 7. The pair are brand ambassadors for Adidas and also sat down for an interview together. 8. Skepta signed copies of his new album 'Konnichiwa' at Sports Direct. 9. Dizzee Rascal linked up with Stormzy in New York. 10. Dizzee was performing his entire 'Boy In Da Corner' album in The States. 11. It was the first time he has performed every track from the project live. 12. Drake showed off his new OVO x Air Jordan VI Low collection. 13. The outsole features the word 'VIEWS'. 14. Chris Brown spent some quality time with Royalty. 15. A number of celebrities celebrated Mother's Day in the US, including Nicki Minaj. 16. As did Big Sean, who posed with his mother. 17. Trey Songz also honoured his mum in style. 19. Lewis Hamilton showed his support Kanye West with a 'Yeezy For President' T-shirt. 20. Drake showed off his huge new OVO chain in a new interview with Nardwuar. 21. And teased PartyNextDoor's upcoming project. 22. While Skepta bought his new album 'Konnichiwa' in Toronto. 23. Jhene Aiko was temporarily on a drip. 24. Martin Garrix linked up with G Eazy in Norway. 25. Tinie Tempah showed off the plaques on his wall. 26. And posed with Idris Elba. 27. Skepta did a photoshoot and exclusive interview with Time Out. 28. And did a special 'Konnichiwa' show in Toronto. 29. He also debuted the album in Tokyo.